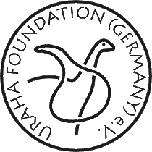 earthquakes of eastern africa – URAHA Foundation Germany e.V. The East African rift system extends from Djibouti and Eritrea in the North to Malawi in the South, forming the boundary between the African plate and the younger Somalia plate to the East. On a length of 3000 km the Earth’s crust is stretched and thinned because the two plates are moving away from each other. The spreading rate, as geologists call it, amounts to several millimeters per year. To accommodate the extension, the brittle upper crust is cut by numerous normal and strike-slip faults, while the lower crust and lithospheric upper mantle deform plastically and stretch like pulled taffy. Movements along these faults are the reason that earthquakes occur within the East African Rift Valley. 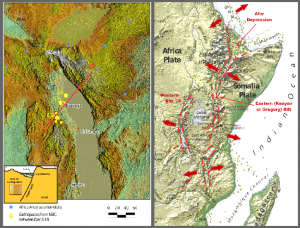 The largest earthquake to have occurred in the East African Rift System since 1900 had a magnitude of about 7.6. On March 10, 1989, a magnitude 6.6 earthquake shook the Salima-Dezda-Mchinji area of central Malawi, killing at least 9 people, injuring 100 and leaving approximately 50,000 homeless. 30 earthquakes, the largest measuring 6.2 on the Richter scale, have hit Karonga district in December of 2009, killing four people, injuring at least 180 and forcing over 200,000 people to evacuate their homes. The 2009 earthquake originated at depths between 6 and 10 km below the surface, and could also be felt in Tanzania and Zambia. 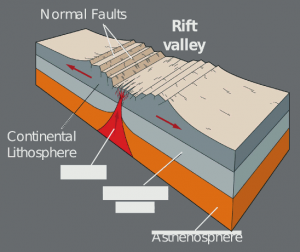 The earthquakes’ epicenters were located about 50 km west of the Livingstone Fault, a fault zone which marks the limit of the Karonga Basin. 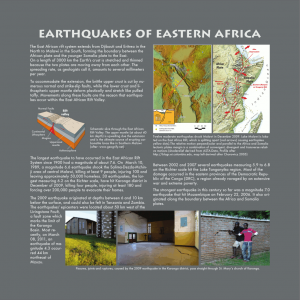 Most recently, on March 08, 2011, an earthquake of magnitude 4.3 occurred 44 km northeast of Mzuzu. Between 2002 and 2007 several earthquakes measuring 5.9 to 6.8 on the Richter scale hit the Lake Tanganyika region. Most of the damage occurred in the eastern provinces of the Democratic Republic of the Congo (DRC), a region already ravaged by an extensive war and extreme poverty. The strongest earthquake in this century so far was a magnitude 7.0 earthquake that hit Mozambique on February 22, 2006. It also originated along the boundary between the Africa and Somalia plates. Fissures, joints and ruptures, caused by the 2009 earthquake in the Karonga district, pass straight through St. Maryʻs church of Karonga.